*Click on image to zoom in new window. Click here for a large rear panel view in new window. The extremely versatile AV7702mkII perfectly and expertly handles any kind of high-resolution multichannel audio format. It also offers an extended network package including audio streaming, internet radio, Spotify Connect, Pandora, SiriusXM and AirPlay. It even includes built-in Wi-Fi and Bluetooth capabilities. Superb surround sound audio quality from the latest tone formats is guaranteed by the powerful 32-Bit SHARC DSP offering high channel separation that leaves no chance for any crosstalk. 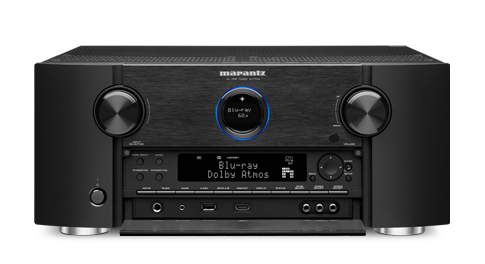 Tone formats include the latest decoding technologies Dolby Atmos, DTS:X via future firmware update and Auro-3D (optional paid upgrade) - which not only provide breath-taking surround sound but also open the door to 3D sound. The DSP is supported by high quality 192kHz /32 bit DAC. 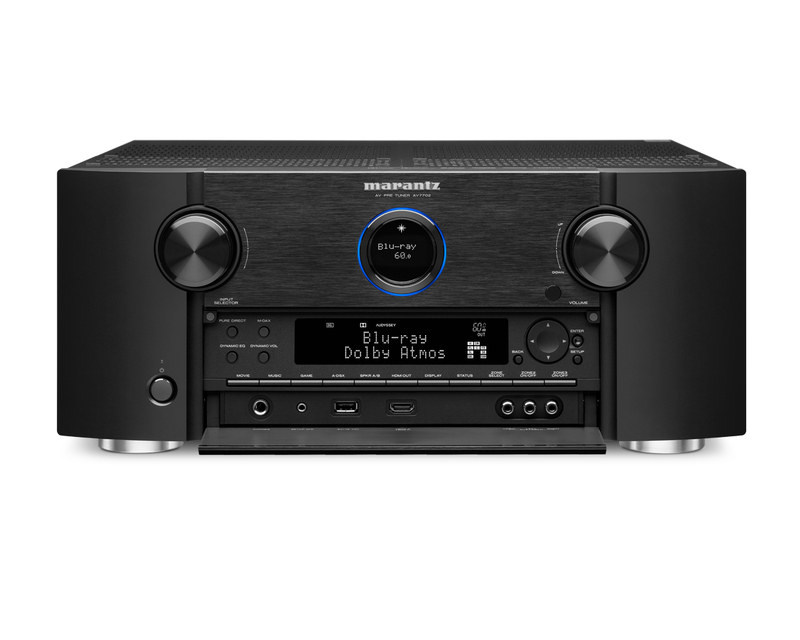 In addition, the 11.2 channel AV7702mkII further enhances audio quality by delicately handling all signals via the Marantz's own current feedback HDAMs preamp, before passing them to the high-quality 11.2 XLR or 13.2 RCA outputs and separate power amp. 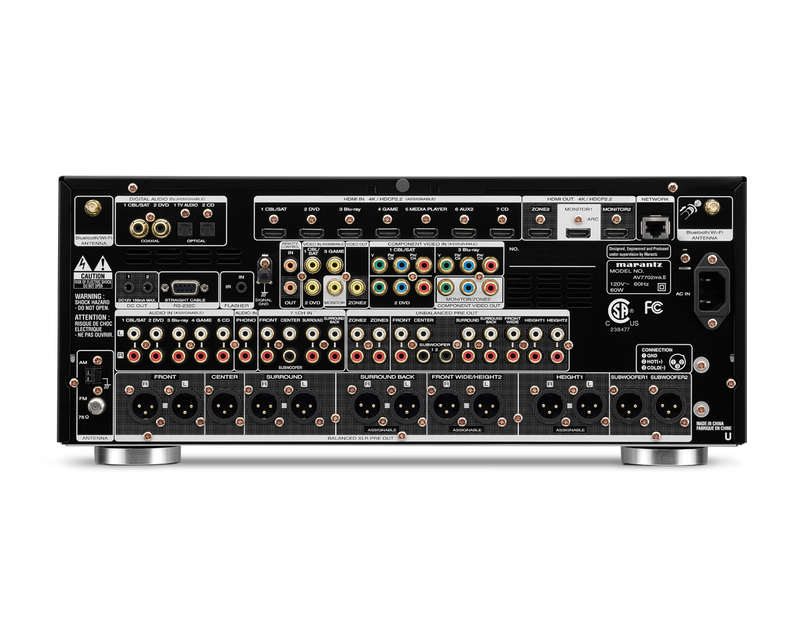 The AV7702mkII also takes supreme care of video signals via the eight HDMI 4k 60Hz pass-through / scaling inputs and sends them to the two HDMI output sockets or independently to the third HDMI output that is dedicated for multi-room. All of them support HDCP 2.2 copy protection for 4k UHD content. There is even a Phono MM input - ideal for those precious vinyls. Setup and operation is quick and easy via the Audyssey MultEQ XT32 auto-calibration and high-resolution Graphic User Interface. It's all there, just waiting to perform. Specifications: Click here for full specification sheet.